Somewhere in deepest darkest Greenwich, out near the Millenium Dome, lies an Odeon multiplex cinema. Formerly a Filmworks, it’s the shape of a huge bucket and holds 18 screens including, since December, an IMAX theatre. How, I wondered, can you cram an IMAX screen into an existing cinema without ripping a good half-dozen other screens out? The answer is that, as it turns out, you don’t. You stick a smaller screen in, slap a big IMAX badge on the outside and a few extra quid on each ticket. Look on the web for information on the Greenwich IMAX and you’ll find that IMAX has been outfitting cinemas with a system completely different to its traditional “build a screen the size of Jupiter and project 70mm film on it” setup for some time. Some people are very angry with the fact that the new, identically named, IMAX system is obviously inferior to the original as it uses a far smaller screen and relatively low-spec projectors (two 2K, rather than 4K, models). You’ll also find an Odeon website blathering about “floor to ceiling screens” and “theatre geometry”, while a local newspaper report shows four kids with an oversized ticket and the rather grainy picture of the screen I’ve reproduced above. Nothing on the web, though, could tell me what I needed to know: should we pick an IMAX showing of the film (conforming entirely to stereotype, we wanted to see Star Trek) at Greenwich or the slightly cheaper 35mm screening next door? So, dear Google indexing robots and those who may be searching for the same information, here’s my two cents. 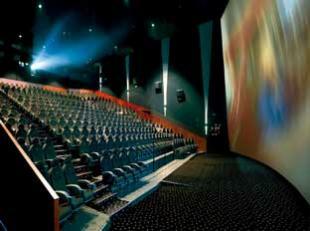 The IMAX screen (9) is, appropriately, one of the biggest – almost 240 seats in three banks. Most of the central bank are “premier” seats that cost extra. We were on the aisle on a side bank about two thirds of the way up, and the view was fine – the rake’s quite steep, so you can see clearly over those in front. The screen itself is nowhere near IMAX size, but large enough for the auditorium and, yes, almost floor to ceiling, while the sound system is impressive if terrifyingly loud. The image in our showing was brilliant for roughly two hours of the film, but marred by annoying blue stripes for about two minutes near the start – whatever caused these, they were fortunately banished. So, is this new, smaller IMAX a con? Possibly – it’s certainly confusing. Is it worth a fiver per ticket if you know it’s not proper IMAX, though? I’d say so: short glitch aside, the picture is better than most that I’ve seen in UK multiplexes lately, so you’re paying a bit more for a high quality digital screening. And, as an added bonus, there’s very little pre-film advertising to suffer through – just a few IMAX idents and two of the dumbest trailers I’ve ever seen (Transformers 2 and, honestly, GI Joe The Movie). Go, gawk, enjoy – just don’t cough up any more for the Premier seats. Oh, and Star Trek is really rather good. Thanks for asking.